Beginning as an investigation into the author's childhood inside a closet aristocracy of "progressive" British entrepreneurs, Vice of Kings uncovers a history both disturbingly personal and shockingly universal. By juxtaposing disc jockey Jimmy Savile's secret cultural, criminal, and political affiliations in the second half of the 20th century with the life and teachings of Aleister Crowley in the first, it uncovers an alarming body of evidence that ritual child abuse is not only the dark side of occultism, but the shadowy secret at the heart of culture, both ancient and modern. 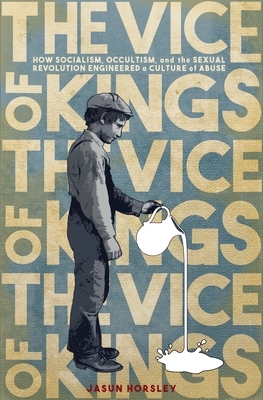 In the process, Vice of Kings reveals an invisible culture behind the one we know, a secret hierarchy that impacts our lives, in ways both subtle and profound, from birth until death. It is a cryptocratic superculture that operates via traumagenesis (intentionally traumatic child-rearing practices), secret initiation/recruitment rituals (abusive social structures), and collective cultural "inception" via mass media and the arts. By shaping our world implicitly, from the inside out, it makes us complicit with it--like the sleeping subjects of hidden monarchs. Jasun Horsley is a writer, filmmaker, artist, and musician. He is on the autism spectrum and sees creativity, spirituality, and the autistic experience (in its purest form) as synonymous: a going inward in order to make sense of what's outside, and vice versa. Writing as Aeolus Kephas, he is the author of The Lucid View.